Started machining for motorcycle parts and weaving machines. Started to produce moulds for mosaic tiles. Get a patent for lattice moulding from iron carburized quenching. Built own factory. Incorporated and establiesd Yamada Seisakusyo co.,ltd. Moved and built a new factory. 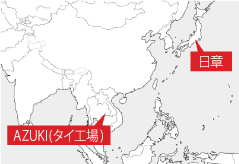 Changed the name to Nikkei co.,ltd. Started produce moulds for steel car wheel. Mold section was spun off from Nikkei co,.ltd. and Nissho co., ltd. was established in Oguchi. AZUKI (THAILAND) CO.,LTD. was established in Thailand. Started mould supporting in Asia. Moved and built a new factory in present location. COPYRIGHT © 2018 NISSHO CO.,LTD.